Is Regency Love available for Android? Will you make it for Android? Is there a walkthrough or guide for Regency Love? Have you considered a Kickstarter project? What kinds of updates do you have in mind for the future? When will these updates be available? Will there be any new interactions with Mr Ashcroft, Mr Curtis, or Mr Graham? Will we be able to romance Lord Sutton? What is the protagonist’s family history, especially with the brother? At the beginning of the game, you’re posting a letter from your mother addressed to your aunt. What’s the significance of the letter? How much did the game cost to make, and how much are you earning? Are all the numbers you’ve mentioned real? Why would you be willing to share them? What exactly are your day jobs, and where are you ladies based? I would like to write a review for Regency Love—could you please give me a promotional code? Do you have a press kit for Regency Love? Is there any way I can help with any aspect of Regency Love? Unfortunately, making a version of Regency Love for Android would cost somewhere in the six figures, and that’s simply way beyond what we can afford. There is a Wikia dedicated to the game which is run by fans, with the occasional input from us. The forum section of the Wikia is also a great place to chat about the game, and share tips/thoughts/etc, so please feel free to join in the discussions. Have you considered a Kickstarter/crowdfunding project? We’ve given this quite a bit of thought, but the situation is a little complicated. Kickstarter (or whichever platform we choose to use) will take a lot of time to run (we’ve estimated at least 40hrs/week collectively for 4 weeks). It is also very unreliable in that we have no idea of how many people would be willing to donate! A lot of you have contacted us and stated your firm belief that we’d get a lot of support, and as much as we appreciate that (you’re all so lovely! ), we still don’t know if the amount raised would be worth the time and effort. For Regency Love 2.0, we’ve actually tried out a “donate if you’d like” feature, but as of 14 July 2015, we’ve had 3,710 purchases of Regency Love, 549 of Mr Graham’s plot, and 199 total instances of patron supports (and I believe some of you have purchased several of those)—this means less than 5% of users are donating. We understand not everyone has the means to help out, and we hope you will equally understand that we currently don’t have the means to make more shinies. If we do end up launching a crowdfunding campaign for the game, it would be to raise money for more in-app purchases. We must also reiterate that time is very much an issue here—on top of the continual work that takes place every time we release something, there is always the mad scramble of the last month or so, which is particularly hard on Melody (our developer). Jenny (our artist) tends to work in bursts, so she needs to block out days or weeks to create all the beautiful artworks, not to mention the time needed for revisions. Finally, Samantha (our writer) does all the blogging and communications on top of all the plotting and writing, which means she has to have enough time to put forth a proposal for the other ladies before there’s any forward movement. We all have our unique strengths, which means we work wonderfully together, but which also means we all need to have the time to focus on our bits, and no one else can step in for the others. So basically, if we have several months every year to work solely on Regency Love, we’d be set! Due to the time and financial restraints previously mentioned, we really can’t say. We know this might be a little frustrating and disappointing, but again, we must ask for your patience and understanding—the intentions and ideas are certainly there! There won’t be any new in-game interactions with these lovely gentlemen, but they may very well feature outside the game. We are working on a spin-off novel centred on Lord Sutton. Specifically, Samantha is writing it independently (with feedback from Jenny and Melody, of course), which will eliminate the serious bug-zapping and copious artwork required in a highly interactive and visual novel such as Regency Love, but will still allow you to experience more of the stories and characters we love so much. We’ll be asking for your support in a crowdfunding campaign in order to release the novel—more details are to come (i.e. when Samantha has completed a solid first draft, and has a better idea of a timeline). The rough release date will be late 2016 or early 2017—since Samantha has a PhD thesis to complete and defend in 2016, we’re afraid we can’t be too specific at the moment. Shhh, no spoilers! If we are to take on the project, all will be revealed in the Christopher expansion pack. But rest assured: we’ve not just thrown it in for good measure—we know what’s going on! Similarly with Christopher, we know exactly what’s in the letter, and where it leads. Initially, Samantha wrote in the opening letter to provide a starting point for one of the other gentlemen, but alas, we didn’t know Regency Love would take so much writing, and there’s just not been an opportunity to expand on it. But again, we definitely know what’s in store! The “original” game cost us over AUD$150,000 to make between April 2011 and December 2013. This is an exceedingly generous calculation, based on the (under-estimated) assumptions that Melody (programmer extraordinaire) worked 40 hours a week, and Jenny (artist of awesomeness) and Samantha (writer of everything) worked 20 hours a week. We have also based this calculation on fees of AUD$20/hour (although entry-level freelancing is AUD$30/hour), which, again, is a severe under-estimation (because we really don’t want to know how much money we’ve actually lost by making something we’ve done out of love). So, according to these numbers, the 94 weeks we spent developing Regency Love cost us $150,400. These numbers don’t include hours spent on admin, any of our overtime and going the extra mile and so on, or any opportunity costs (for example, the hourly rates of our day jobs range from AU$50-80). After all external expenses were accounted for (web hosting, Apple licences, etc—but not our own fees), in the last Australian financial year (1 July 2014 – 30 June 2015), we each got AUD$2,200. While some of these numbers are (under-)estimations (though Samantha does keep spreadsheets of the work she’s done), we do have analytics, invoices, and statements, and we want to be transparent and straightforward with you because we’re certainly not in this for the big bucks! That being said, it’ll be nice to afford more than peanuts from our Regency Love “earnings” (mmm, peanuts…)! Jenny is a freelance artist working at a studio, and is currently studying to improve her skills. Melody is a user-experience designer for an online open-learning website. Samantha is completing a funded PhD in Shakespeare studies, and sings for her tea in a cathedral choir. Jenny and Melody both live in Sydney, Australia, and Samantha is currently living in Belfast, UK. We use Dropbox, Asana, WhatsApp, and Skype to communicate and work across the distance, and we delay our “release parties” for as long as it takes for Samantha to make the flight back to Sydney every year or so. Certainly—please email samantha at the-domain-of-this-site, and she’ll set you up with a promo code for the core app. However, Apple still doesn’t allow promo codes for in-app purchases, so I’m afraid you might have to purchase the additional plot for yourself. If you are a blogger or know any bloggers who might be interested in the game, please consider reviewing Regency Love, or contacting them on our behalf. Samantha has spent about 30 hours in total contacting potential reviewers, and has had trouble scheduling that in lately, so it’ll be a massive help if you could help out by notifying sites or communities. If you come across any competitions for games (independent or otherwise), Regency-related topics, feminist contributions, interactive/innovative fiction, or anything else that you think might be relevant, please consider nominating us or contacting Samantha about it. 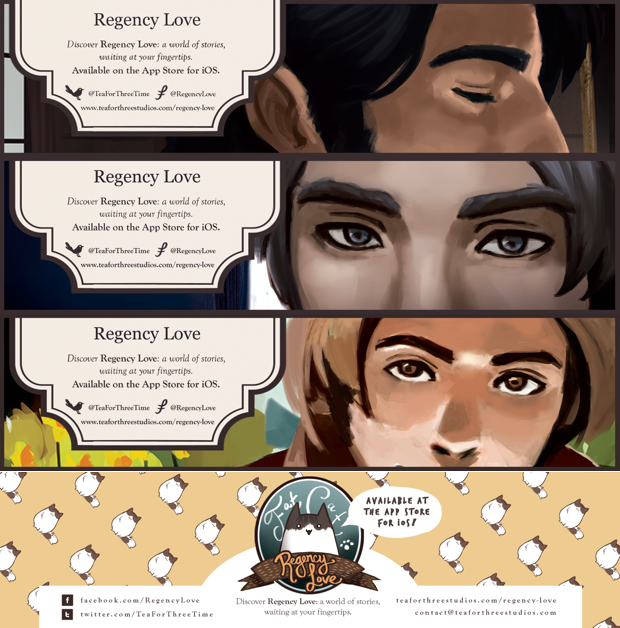 We’ve also started a Wikia for Regency Love, which is community-based, and on which we won’t be spending much time. We’ve already had some wonderful volunteers contributing to the Wikia, and we would love it if you would continue to help us in creating a wonderful community, both on Wikia and Facebook. If you’ve enjoyed Regency Love and have a moment to spare, please let us know either through the contact form or by emailing us at ‘contact’ at the-domain-of-this-site. Your words and comments really do mean a lot to us, and we’ve often held impromptu warm-and-gooey chats on WhatsApp when we receive a lovely piece of encouragement, especially on a tough day—after all, we’re primarily doing this out of love, and it’s wonderful to know if you love our world, characters, and stories!